Throughout the Vendée you will find numerous establishments that cater for those who have a passion for horse riding, or for those who just want an hour or two with friends or family on horseback. If you want to take in the wide skies and find those hidden treasures amongst the diverse landscapes of the Vendée, then trekking on horseback or by horse drawn caravan cannot be bettered, and you will find that here in the Vendée there is a great deal to choose from. Below are some of the centres that specialise in horse riding. L'Aiguillon sur Mer. Ranch de Cacharel 02 51 29 42 82. 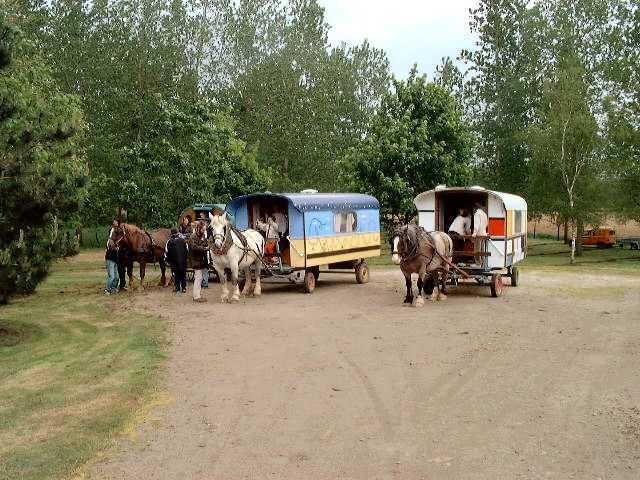 Hire of carriage with driver, carriage driving courses. Trekking with a donkey, trips in Mervent forest and Marais Poitevin. St Maurice des Noues and Vouvant. La Garreliere. Benet. Stable of the Marais. www.ecuriedumarais.com. Breeding ponies and horses on sale. 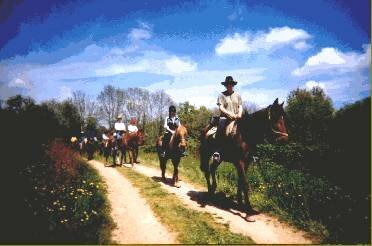 Horse Riding from 1 hour to whole day (reservation). Livery - training - breeding - western riding. Ferme Equestre D'Emile Pat. La Combe, La Tablier, Tel 02 51 46 72 19. Certified "Cheval Qualité France" & "Poney Qualité France" standards. Horse and pony riding lessons for beginners and advanced riders. First-rate facilities on a 5-hectare site. Indoor manège, 3 outdoor schools, cross-country course. Tarifs: 1 hour with horse €16, 1 hour with pony €13. Hand-led rides from €4 to €8 for 3 to 6 years old. Open all year round. From Monday to Saturday from 10.00 a.m.to 7 p.m..
July-August from Monday to Saturday from 9.30 a.m. to 7.30 p.m.. Located close to the forest and beaches of Olonne, the centre offers horse and pony rides on the beach, in the forest or through the marshes. Horse-riding lessons given by state-qualified instructors, from beginners to advanced. Horse and pony rides, and horse-drawn rides for all the family. Introductory pony and harnessing course for 5 to 12 years olds. St Jean de Monts; La Chevauchee des Dunes, Ave des Epines, Orouet, Tel. 06 87 48 12 97. Club Hippique le Havre de Vie, Route du Mailleau. Tel 02 51 58 27 30. Nellys Ranch. Rue du Moulin Casse. Tel 06 23 13 76 25. St.Reverend. Centre Equestre de l'Aumariere. Tel.06 84 87 45 04. Haras de la Vendée. La Roche-sur-Yon. Horse Racing. Hippodrome des Sables d'Olonne. From June to late September, mainly trotting races but also some gallops.